My mum a genius when it comes to cooking. She never fails to cook up a tasty homemade meal. Near the beginning of the month I was feeling under the weather and choked with the cold. Mum came to the rescue with dinner delivered in tupperware. That explains why there are no cooking or nicely presented photos. 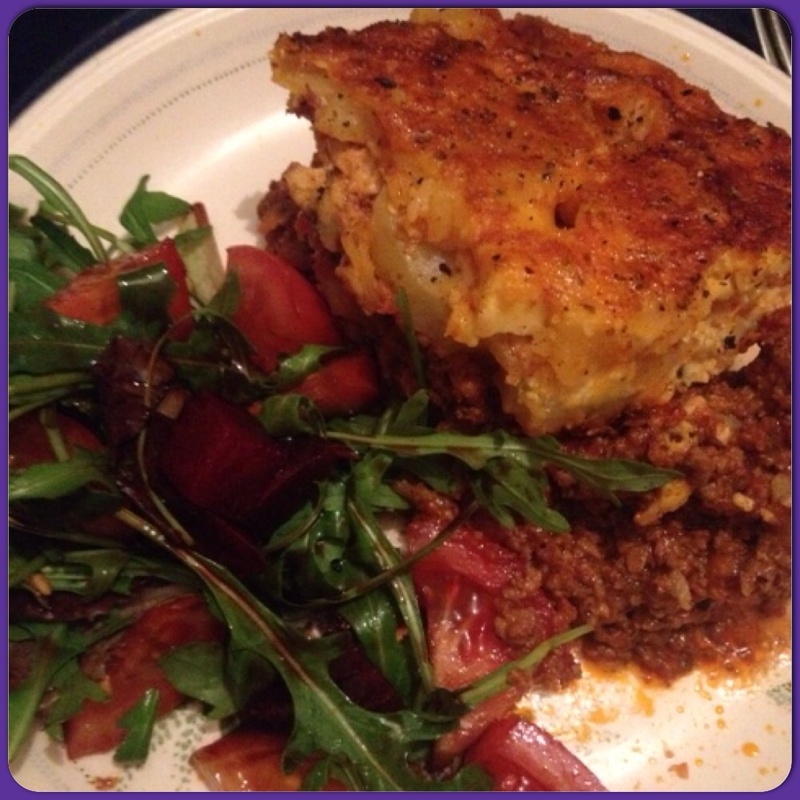 This is Ali’s take on Moussaka. Boil potatoes and set to the side. Brown the mince. Finely chop the carrot and onion and fry off in a pan (approx 5 mins). Add tinned tomatoes and a tea spoon of cinnamon, parsley and all spice you can also add garlic if you wish. Simmer to thicken. Using a oven proof pot or dish line the bottom with the mince mixture. Slice the boiled potatoes and layer directly on top of the mince. Using a separate bowl to Crete the mixture for the top layer. Add a little of the yogurt to the cornflower mix through then add the remaining yogurt. Whisk the eggs and add them to the cornflour and yogurt alongside half of the Parmesan. Mix through. Slowly pour over the potato layer. Season with salt, pepper and cinnamon. Sprinkle the remainder of the Parmesan over the top. Bake in the oven for around 1hour or until gold and bubbling. Once removing from the oven set aside for around 10 minutes to allow the bubbling topping to set. Served with a side of Rocket, tomato, beetroot and balsamic salad. It’s slightly difficult to type up my mums recipes because she doesn’t strictly use amounts. She tends to throw things in and it always ends up tasting good. This dish is great for using up left overs and is relatively inexpensive. Using fat free Greek yogurt rather than cream or milk makes it skinny minni friendly.